BANGI, 22 Mac. 2012 – UKM will set up a Cyber Security Academy in collaboration with CyberSecurity Malaysia (CSM) to provide profesional programmes that will produce the expertise needed in the field. It is aimed at meeting market demand for such professionals both locally and globally apart from helping to produce a future generation who are highly skilled in cyber security for the benefit of society. Senior Manager of Technology Transfer of the Centre for Collaborative Innovation UKM, Encik Muhamad Nasir Raki told UKM News Portal that the UKM-CSM Global Cyber Security Academy hopes to begin providing various programmes on cyber security this June. It is scheduled to be fully operational by the end of the year. En Nasir, who is also a member of the UKM-CSM committee to set up the academy, said it will make UKM a versatile institution of higher learning and further enhance its reputation internationally. A three day workshop was organised by The Faculty of Information Science and Technology (FTSM) in Seremban last Friday to discuss the establishment of the Academy. It was attended by teams from UKM and CSM. 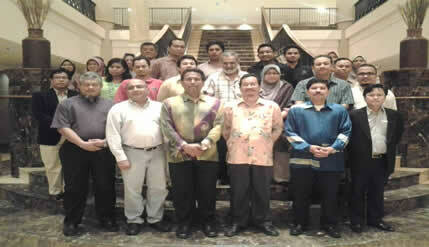 The 16 member UKM team was headed by FTSM Dean, Prof Dr Abdullah Mohd Zain and include members of the faculty. The CSM team of 16 was headed its Head of Innovation and Commercialisation, Encik Anwer Yusoff. CSM is an agency under the Ministry of Science, Technology and Innovation. The workshop discussed the strategic plan for its implementation as well as developing its academic curriculum and profesional training. Deputy Vice Chancellor (Student and Alumni Affairs), Prof Ir Dr Osman A.Karim when opening the workshop on behalf of the Vice Chancellor, Prof Tan Sri Datuk Wira Sharifah Hapsah Syed Hasan Shahabuddin said the advancement of technology in addition to bringing about benefits had also spawned negative elements which were found to be difficult to control. He said among the measures needed to face the threats was to have an effective data rescue system should there be damages to the main data depositary, due to breaches or to natural calamities. It was thus important that there should be professionals in cyber and information security to be ready to tackle any criminal threats lurking in the virtual world, Prof Osman said. En Nasir said development of Information and Communication Technology (ICT) has changed the lives of the people and has made the world borderless. The information revolution has also made it possible for almost any information to be retrieved at the fingertips. This has also impacted the values people hold dear and at times brought about social ills and the degradation of values. Thus ICT needed to be monitored from being misused, he said. En Nasir also said that the ICT infrastructure had been used to communicate ill intentions and had thus brought about social ills in a society. The cyber world had also brought about political instabilities and even assist in bringing down governments like in Tunisia, Libya, Egypt and Yemen. Thus governments can be toppled and nations thrown into chaos by street demonstrations and unrest facilitated by ICT due to involvement of third parties and invisible hands with their own hidden agenda. Moving under the banner of NGOs and the pretext of democracy and human rights, it had brought about instability to nations through the clever use of ICT such as Blogs, Facebook and Youtube to spread propaganda, slander and even false accusations that can easily ignite harmful sentiments among the people, En Nasir said. They had brought about unrest which can easily go viral at an enormous speed and threaten peace and bringing about riots and civil wars in nations, he said.